The King (Chinook) Salmon (Oncorhynchus tshawytscha) is the State Fish of Alaska. 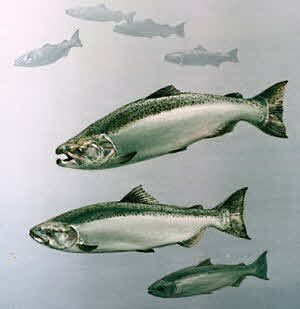 Chinook Salmon (Oncorhynchus tshawytscha) was designated as the Official Fish of Oregon in 1961. The largest salmon, a chinook salmon, caught with rod and reel weighed over 97 pounds and was caught in Alaska on May 17, 1985.